Rega, designed and built in Southend-on-Sea in the UK, have been making high performance audio equipment for over 30 years with the current design team lead by founder Roy Gandy. Rega produce specialist Turntables, CD players, amplifiers and speakers, flying the flag for British Manufacturing. Rega products have been been developing dedicated Hi-Fi amplifiers for over 30 years and the Osiris and Brio-R are the culmination of these efforts. With the recent introduction of the Osiris, Rega now offer options ranging from budget Hi-Fi components to truly audiophile equipment which stands alongside other British manufacturers and products as the best that British design and engineering has to offer. With the recent advancements in the Rega integrated power amplifier range, the Elicit-R builds on the technological advancements and design characteristics of the Brio-R. The Elicit-R features a high quality, built-in moving magnet phonostage to get the very best from your vinyl collection. This, coupled with polypropylene capacitors throughout the signal path, improved power supplies, brand new custom-designed case and an increased output of 100 watts per channel give the newest incarnation of the Elicit power, substance and style. With the addition of the Rega DAC or Apollo-R CD player, the Elicit-R provides the perfect Rega system for your listening room. The Elex-R is a sublime blend of Brio-R design with the power circuits and advanced phonostage of the Elicit-R. Rega’s engineers have achieved the perfect balance of power, control and dynamics, delivering a performance that always puts the music first. Some of the key features include the custom full-width case with improved heat dissipation, 90 watts per channel into 6 ohms / 72 watts into 8 ohms, a new custom transformer and a dedicated mini remote handset. Time, effort and money have been spent on developing the circuit and construction, utilising the highest specification of components throughout. As part of the design, Rega have included useful features, like a pre-amplifier output to enable the new Elex-R amplifier to be used in a wide combination of systems, and have avoided superfluous elements such as tone controls or headphone socket as they can obstruct the signal path and degrade sound quality. The Elex-R has been built to Rega’s extremely high standards of reliability and quality to ensure many years of musical enjoyment. The Rega Brio-R is the modern rendition of the classic Rega Brio amplifier which won many awards and plaudits for its combination of performance and value for money. 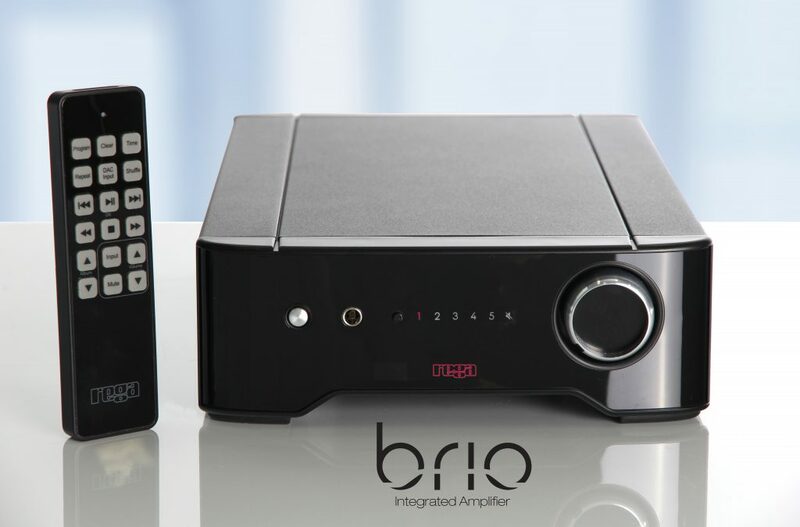 The Brio-R integrated amplifier is cased in a shoebox-sized aluminium enclosure, available in either Black. During the Brio-R design process Rega reviewed the circuit and improved the low and high current power supplies, coupling and bypass capacitors. The on-board phonostage has been improved to reflect the recent improvements in Rega’s Planar turntables, where the input sensitivity has been increased along with a revision of the sub-100Hz part of the phono frequency response. The Brio-R uses Toroidal transformers to give this compact unit a real punch and control of even the most difficult floorstanding loudspeakers. The new direction with Rega’s R range blends amazing value for money with audiophile performance in a small enclosure; the holy grail of Hi-Fi audio technology.